The one time I finally get around to catch up with ALF and GI JOE : Special Missions, I get a frantic call. Faster that you can say #cupcakegeddon, I jump on top of my Powell Peralta skateboard and break it in twain. I gotta lay off the tortas guajoloteras. So I hightail it to Katriona‘s house (bless *69) and when I arrive, she’s outside, her hair with sprinkles arranged in perfect fractal fashion, her hands stuck to a book opened in a page that read “carrot cake” and a couple of squirrels nibbling at the buttery smelling dough that keeps erupting from her soon to be structurally-damaged house. The band? Hey Sholay. The EP? Cloud, Castle, _______, a collection of six songs, all of them orange-tinted. After the slightly lukewarm reception that ((O))) (our take) got from some rather picky reviewers, the band decided to shrug it and keep doing their psychedelic, dark pop, which is exactly the sort of magic mojo that caught my attention. Ignoring a despicable act committed towards their instruments, the band holed up with their butler/sound engineer maestro Dave Sanderson and created a wonderful slice of psychedelia that is as refreshing as squeezed orangeade. Once SO19 clears the area of diabetic squirrels (sorry, mother nature), I go inside Kat‘s house and help her clean the place. Surprisingly enough, her Kenwood stereo still works (except the tape area, ruined by constant playing of Minus the Bear mixtapes). I press play and as I grab a mop and a fez, I draw a smile while ‘WDYRWMTB’ plays. Maybe it’s the vanilla fumes getting me high, but there’s a lot of good vibes in this opening track. As we make a funeral pyre for Kat‘s pet chinchilla, we listen to ‘If the big fat yellow thing in the sky was to burn out…’ In true Hey Sholay fashion, the song changes the mood drastically, with a stark set of chords expanding over dark violet skies. Liam Creamer‘s voice, always delivered as a sort of pent-up anger/hug is just perfect in this track, which reassures you that as fizzy pop the first track sounded, you’re in SholayLandia and there will be atmospheres and drones. The very 80s synth clashes with random noises (I think it’s the chinchilla’s soul going to Mictlán)create a lovely drone that lifts off. And lift off is achieved indeed.’Djdjdjjdjjdjjhhh’ (my supervisors’ reaction to everything I send – fact) is a gorgeous instrumental track, building on a boondoggled bass and drum combo. Swelling synths, a bit of sound manipulation and you get as far as you can from Planet Pop. This is where Hey Sholay excel at : gorgeous, expansive atmospheres with a twist that is miles better than anything Shyamalan throws at us. Speaking of throwing, I’ve started a food fight with Kat. She goes akimbo and jumps like Chow Yun Fat, I can only emulate Willem Dafoe in Platoon, but instead of a grieving piece of classical musical (Barber‘s ‘Adagio for strings’, for you non connoisseurs) I get a peppy track for my death scene. ‘B is for Berlin’ is sort of “welcome to the back of dream pop!” but there’s enough Baroque stylings to sink your reviewing teeth into. Again, it’s those instrumental breaks that lift these songs from “rather good pop” into something else. So, this Cakemaggedon mess has been more taxing than the Pasta Incident from that No Doubt video. It matters not, we clean the place. We get a couple of milk cartons and drink while ‘Love and hat (a tattoo on the knuckles)’ rips through the hair. Dancey without a discernible beat, it feels like a more relaxed relative from their track ‘Ol’ St. Nick’. The song hints to a possible explosion, but it’s not to be. Deceptive & enjoyable. ‘A Marigold (calendula officinalis)’ feels 80s not in the new wave/drum machine/half sleep vocal style, but more of a slightly gothic sort, a route that is truly abandoned for the Hey Sholay sound: big sounds, synth arpeggios, cranky drumming and a healthy dose of bass. You do feel the ending of this EP is abrupt and I guess the old advice of “always leave them wanting” applies. 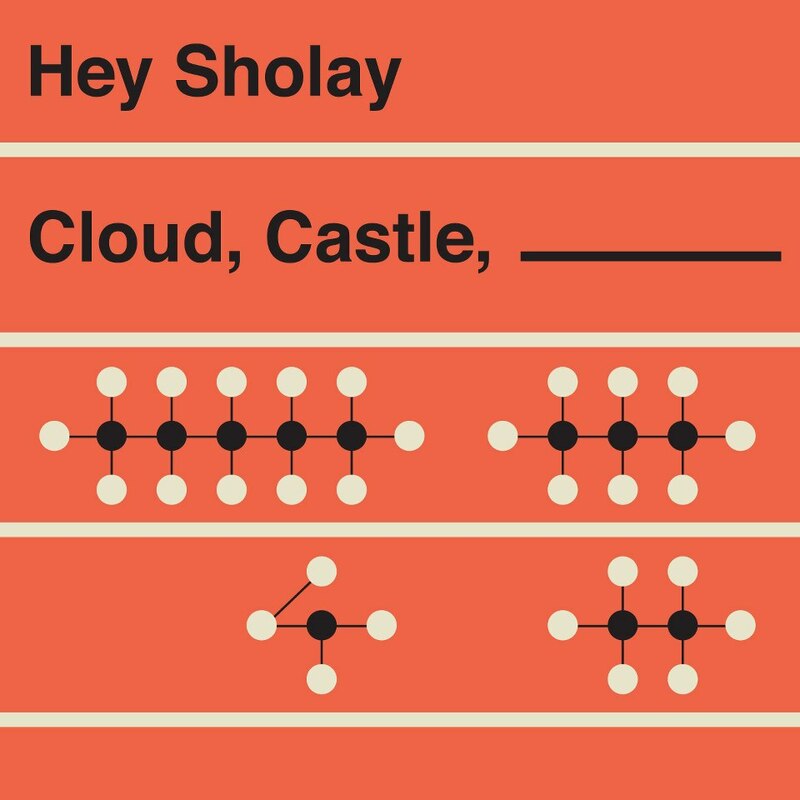 So, there you go, Cloud, Castle, _______ is a rather enjoyable EP by Hey Sholay. Give it a shot, you probably won’t have to scrape crème fraîche from a friend’s vintage dress collection. But, hey, I didn’t lose a rabbit and won’t get sued for doughnut thievery? Hey Sholay Soundcloud.Myspace. Twitter. Last.Fm. Facebook. Blog. Posted in Creative writing, rant, reviewsTagged Cakeggedon, Castle, Cloud, Hey Sholay, Kokaburra sings and nicks your cupcakes, SHOLAYHUGS, _______Bookmark the permalink.